This Poshbrood recently enjoyed two lovely nights at 101 Year-Old and family-owned luxury Goring Hotel in Belgravia. The Goring is regarded the favorite address for anyone looking for the quintessentially English hotel in the heart of London. Just steps away from Buckingham Palace, The Goring recently received much international press because Kate Middleton spent her last night as a commoner before her wedding to Prince William at The Goring Hotel. 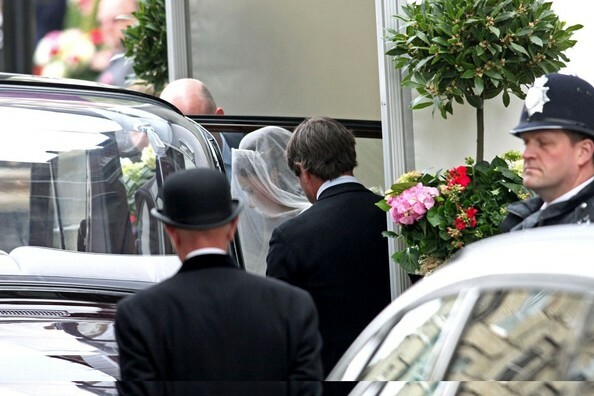 Here is Kate leaving the Goring on her way to marry her Prince! We arrived at The Goring after an overnight flight on Virgin Atlantic (LOVE LOVE LOVE that Premium Economy!) from Washington, DC with a 7 year old girl. The hotel had arranged for car service to get us back to The Goring, which we were grateful for. We were happy but tired when we arrived and the staff was so warm. At check-in we were invited to have a seat in the parlour and they asked us if we wanted any juice or coffee. Such a lovely way to check in! Luckily for us, the occupants of the room had checked out very early that morning and we were in our room by 10:30 am. The hotel has just been renovated and our room was a Deluxe King/Twin room. It was traditionally English but in a very glam and modern way. We both oooohed and ahhhhed when we entered. The Goring has only 71 rooms and suites and every one is different -- although most have the signature "sheep" -- a wholly footstool to rest your feet at the end of the day! The marble bathrooms, too, were gorgeous with a huge soaking tub and separate shower. Have you ever seen such a pretty potty?!! Every bedroom is individually designed using a range of wonderful colour palettes. Silks from the ancient house of Gainsborough, rich fabrics designed by Nina Campbell for her suites, amazing bespoke pieces of furniture are all brought together with the very latest in modern technology to produce these wonderful rooms. At the touch of a button we were able to adjust the lighting from bright to daytime to mood. We were exhausted and crawled into the delicious fluffy bed for a nap and slept for 3.5 hours -- oops! We showered and met some of our UK friends for afternoon tea at the Goring. We opted for the Bollinger tea (the addition of strawberries and cream and champagne) and in the summer the tea is beach themed. We had trifle with umbrellas in it, flip flop cookies and chocolate covered ice cream served in a beach chair. We had three small children with us and it was fantastic. The Goring is luxurious but there is absolutely no snoot whatsoever and they go above and beyond to make little guests happy and comfortable. How stunning is the Goring china? You can purchase it! After the tea, the children had a ball exploring the "beach" are the hotel stages in the summer. There are also little nooks and crannies in the yard, hidden by boxwood hedges that the kids enjoyed and made me want to come back for an adult beverage when the "Beach Bar" was open. Fabulous! On our way back to the room, we rode the intimate elevator with Jerry Hall -- check off the celeb sighting! She was very sweet with Lucy, complimenting her on her dress. We changed, grabbed some bread crumbs from the hotel staff and walked to the front of Buckingham Palace and then through St. James Park, the oldest park in London surrounded by three palaces. Lucy played on the playground, ran off the extra steam on the extensive greens and then we feed the ducks and swans. It was a beautiful evening and it was a lovely place to spend some time. We then walked up to Tralfagar Square and over to Haymarket Street to find "pasta" for Lucy. We stumbled upon Prezzo, a hip, casual Italian restaurant that offered an impressive kids' menu -- a dinner of 3 courses plus a drink for £4.95. Our second day we hopped The Original Sightseeing Tour double decker bus to get the lay of the land in London. It is a great way to get acclimated and have an overview of the main historic buildings and sites. It is hop on and hop off and also gets you a Thames River Cruise. Unfortunately, we rode the bus in the middle of the "heat wave" (82 degrees) and our bus broke down at Trafalgar Square. They were sending another but we opted to jump on the Tube to get to The Tower of London. Oh, The Tower! A must-do for any families: the jewels, the torture chamber, the Tudor Armor, the ancient graffiti from prisoners. We loved it and if you time it correctly, you can even see a "mini" Changing of the Guard in front of the Royal Jewels. The Tower is truly incredible, we loved seeing the Roman ruins of ancient London, learning about the moat and the lions that used to guard to castle. After a visit to the Tower, we recommend eating at super-kid friendly and wallet-friendly Wagamama. There are many locations in London (and in Heathrow!) but we tried the Wagamama on Tower Hill in the glass building across from the London Tower - the kids menu is perfect. We noshed on chicken with noodles, edamame and Lucy tried cococino, warm frothed whole milk with a sprinkling of chocolate powder. After lunch we hoped on the Thames River cruise from the Tower Pier (next to the fabulous Tower Bridge) back to Westminster Pier (Big Ben). Again, a great way to see the city, learn some additional history (like, the original London Bridge is in Arizona??!!) and it got us very excited for our turn on the London Eye! After a bit of quiet time at the hotel, we ventured out again to Harrod's. Lucy got some fancy shoes on sale, some chocolate and Mommy got a dress. The Egyptian design, architecture and escalators are fascinating and we also visited the Diana and Dodi shrine on the ground floor. That evening, we decided to have a pub dinner. A real pub dinner, not a gastro-pub dinner. We settled on The Star Tavern in Belgravia, which is an easy walk from the hotel. You can go onto www.pubs.com and search for child-friendly pubs and other criteria, which is a great help. The Star Tavern was located at the end of an adorable, cobbled mews. We adore the beautiful flowers and hanging baskets sprouting from all of the pubs. The Star Tavern was was built in the early 19th century to cater for the domestic staff of the many great houses of Belgravia. The mews cottages were used for stabling horses and to accommodate the grooms and coachmen. Today they are more likely to house a millionaire than a servant. We enjoyed a simple but delicious steak dinner with salads and a very large ice cream sundae for dessert. The staff were very friendly and Lucy thrilled to be in a real "pub." Incidentally, The Great Train Robbery was planned here! After our second blissful slumber at The Goring, we started the morning with a proper British breakfast in The Goring Dining Room. Oh. My. Gorgeous. Can I have this Swarovski crystal cherry blossom chandelier in my house? We enjoyed pasteries, juice, coffee, eggs, bacon and porridge and needed our strength for the big day ahead. First up, a tour of the Royal Mews (the stables to you and me...). This is a must do with any kids -- you get to see the Royal Horses, have a tour through facilities and see the carriages that were used for Kate and Wills' wedding, Princess Diana and Prince Charles' wedding, a Royal custom phantom Rolls Royce and the humongous Gold State Coach that carried The Queen to her coronation. The 24ft-long coach, built for George III in 1782, was used during the Queen’s procession to St. Paul’s Cathedral for the Golden Jubilee. When George III ordered the coach, he sold all his father and grandfather’s state coaches to meet the 7,562 pound cost of the new coach. But while its “fairytale” design has always delighted the crowds, royal occupants have found it less than comfortable. William IV likened traveling in it to being being abroad a ship in rough seas. The Mews' gift shop is also an excellent stop for non-cheesy souvenirs. Next we did a stop at the Tate Modern. It is a fabulous museum for kids with the modern art, bright colors, sculptures and a family area. Lucy and I had so much fun exploring the museum and the position on the river was also nice for a walk along the quay. We sauntered to the Anchor pub for lunch. Big mistake. Although historic (Shakepeare apparently ate there) and beautiful from the outside, the service was horrible and food mediocre. Apparently half the staff hadn't shown that day. We waited an hour for humdrum fish and chips. A hungry child is a cranky child...no fun. You're much better off at the Wagamama around the corner. We were rewarded later with our tour of The London Eye. We were so lucky to have such sunny, clear weather and the jetliner views of London are spectacular. You can see Parliament, Big Ben, Buckingham Palace, all the parks, St. Paul's Cathedral, Old Vic Theatre, the works. You can do a champagne or Pimm's ride on the London Eye but you have to book ahead and they are at certain times. We'll try that next time! We headed to a nearby park for some exercise and then later had dinner at All Bar One in Waterloo. All Bar One is a stylish and modern wine bar with a simple but stylish menu, fun and delicious cocktails and an extensive wine list. The staff was attentive, helped Lucy with her off the menu food request and the food was delicious. There are several All Bar One locations in the UK -- we highly recommend it! A shopping trip to Harrod's (including a snack in the food court), a visit to Princess Diana Playground in Hyde's Park, the Changing of Guard and a bike ride with Daddy around London completed our kid-friendly London visit. Before check out, The Goring gave us a VIP tour of some of the rooms and the Royal Suite where Kate stayed. So elegant, so Posh, so very Dutchess of Cambridge! Even the smallest room is perfectly outfitted with every amenity and decorated to perfection. Our next trip, I'm hoping for a balcony room overlooking their gardens. Imagine your morning coffee and a copy of News of the World...ooops, I mean The Telegraph. The Goring Hotel staff takes terrific pride in offering the highest levels of personal service, where guests are sincerely welcomed and can enjoy elegant individual accommodations, the tranquillity of its own private Gardens, and the utterly splendid Lounge Bar and Dining Room. They are extremely family-friendly and offer discounts for adjoining rooms and several family packages with amenities for the smallest guests. We highly recommend this hotel for posh families visiting London and know that the Goring family will take very good care of you and your brood! Room rates begin at £350. For the best rooms at the best prices, book through Poshbrood/SmartFlyer.